L.U. 8 (as,em,i,mar,mt,rts,s&spa), TOLEDO, OHIO — Greetings, brothers and sisters. Congratulations to Bodie Mechanical Services, which recently signed on as a new signatory contractor with Local 8 — and welcome to the Bodie electricians who joined the Brotherhood. A years-long effort by past and present organizers should not only strengthen our market share in the southeastern area of our jurisdiction, but also further increase the high standard for which we strive everywhere. The Fostoria-based company brings in 21 journeymen and apprentices. The annual Local 8 Dinner/Dance was Saturday, March 30, and as always everyone had a great time. Congratulations to Bro. Dennis Duffey on his retirement! Pres. Eric Grosswiler presented Duffey with his retirement watch at the Sept. 17, 2018, union meeting for 47 years of service. Congratulations, Dennis, and enjoy your retirement! We mourn the loss of Local 8 members who recently passed away: Ray McElheney Jr., William "Bill" Baldwin; and retirees Allen Kern, Spencer Niles, Barry DeWees, Richard Akenberger, Henry Lino Sr., and Gerald Clark. Our sincere condolences go to the families and friends of all who have departed. May our brothers rest peacefully. Stay safe out there and remember to attend your union meetings. 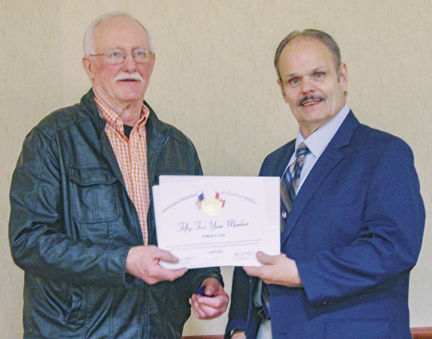 Local 8 member Dennis Duffey (right) receives retirement watch, presented by Pres. Eric Grosswiler. L.U. 16 (i), EVANSVILLE, IN — Despite the heavy demand for electrical workers over the holidays, Local 16 still honored its commitment to those in need. Fantasy of Lights is one of the local union's major community service projects. This holiday-themed light show generated over $163,000, the best it has done in its 25-year run. The amount raised represents 3,333 sessions of rehabilitative therapy for people who are not able to afford it otherwise. Since its inception, FOL has raised over $3,460,000, covering the cost of 70,000 therapy sessions. The Political Action Committee has had a busy spring. They sponsored their first BB Gun Shoot/Chili Cook Off/and Texas Hold'em Tournament. The event provided a great afternoon of brotherhood. PAC will hold a golf scramble on June 14 and is planning another poker run for the fall. Our need to remain legislatively aware was recently highlighted when state Sen. Chip Perfect proposed Bill 342. This statute would eliminate most of Indiana's child labor laws. Please help the PAC promote political education, support like-minded candidates, and protect Indiana's children. This year's IBEW Local 16 family picnic will be held May 19. L.U. 24 (es,i&spa), BALTIMORE, MD — At press time, we are currently in negotiations with another one of our sign companies, Clear Channel Outdoor, and hope to again reach an agreement that will benefit all parties. Later this summer, we will be entering negotiations for the Eastern Shore and Rommel Electric agreements. This year two wage surveys were conducted, one by the state of Maryland and another by the federal government. We entered over 400 surveys for the state and the same for the federal. As of this writing, Maryland has concluded their survey and it appears they chose not to include all the surveys submitted for two counties, which lowered the rate in those counties. We filed objections and were able to overturn one. However, we are still fighting to have the other changed. Thanks to Bro. Sam Curreri and Administrative Asst. Marianne Sickler for their hard work and diligence on this. Thanks to the members who helped make the annual Children's Christmas/Holiday Party a success. Helping with handing out toys, serving food and drinks, introducing the children to Santa, and hosting the puppet and magic shows, these volunteers gave up time with their families to see that all the others had a great time. To the volunteers: Thank you for what you do. Our union is stronger because you care. Local 24 volunteers helped make the local's Children's Christmas/Holiday Party a great success. L.U. 26 (ees,em,es,govt,i&mt), WASHINGTON, DC — It's finally springtime in Washington, D.C.! Preparations have officially begun for the golf outing, the Virginia and Maryland picnics, and the fishing tournament. The Local 26 Scholarship Committee is reviewing the many applications received, and a decision will be made soon. Winners will be announced in our quarterly magazine and in an upcoming issue of The Electrical Worker. Thanks to the many outstanding applicants for their participation! Best wishes to new retirees: Jesse T. Miller III, Brian T. Levenson, Charles F. Scullen, Roger L. Sweigert, Preston C. Taylor Jr., Elery Dunn, Donald J. Defibaugh, Joseph C. Watts, Michael R. McLaughlin, Keith D. McVicker, Karen M. Greenfield, Christopher A. Toborek, Ralph E. Neidert, Barry A. Brown, Kim Vu Quy, Norman J. Vincent, Marcus W. Robinson Jr., Steven W. Redman and Richard D. Thomas Jr.
Condolences to the families of members who passed away since our last article: Randall McClanahan, Matthew R. Engel, George W. Mullin, John Maher, Victor C. Beahm, John A. Farrell Jr., Nicholas S. Ridgely, Everett R. Alcorn Jr., Keith A. Powers, Thomas M. Mitchell, James F. Laddbush, Gerard I. Umerley Jr. and Yaw Awuah. L.U. 34 (em,i,mt,rts&spa), PEORIA, IL — Local 34 enters the new year with renewed excitement and vigor. Throughout these winter months, work has remained steady. A busy spring and summer are anticipated. The area has projects on the horizon and the state of Illinois will soon release funding for solar projects. Quite possibly the most exciting news for Local 34 recently came from Washington, D.C.
IBEW Local 34 has received approval from the I.O. to construct a new office and union hall for its members. The new facility location in Bartonville, IL, will place the hall adjacent to the JATC and near NECA, creating a campus with great possibilities for collaboration and communication. Currently, the Local 34 Building Association is interviewing architects to find one that shares our vision for the future of Local 34. Thank you to Bus. Rep. Dave Lowder for organizing the annual Local 34 blood drive. Dave was able to persuade members to participate and donate blood for the good of our larger community. Let us remember and recognize departed member Mike Kyle, who passed away Jan. 16. Mike was a former JATC instructor who continued to volunteer and stay involved with the local beyond his days as a working journeyman. Rest easy, brother. Local 34 Training Dir. 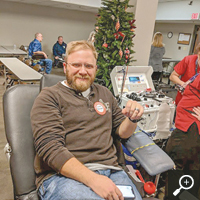 Brandon Currie at Peoria Labor Temple meeting room during the local's annual blood drive. L.U. 38 (i), CLEVELAND, OHIO — Renovations have started at the historic May Company Building on Public Square. At press time, the job is ramping up with many members from Local 38 on site working for Ullman Electric. The May Company opened in 1915 and during its heyday reportedly was the third-largest department store in the United States with 800,000 square feet of space. Many of us who are older remember shopping there and especially going there during the Christmas season via the rapid-transit train. The store closed for good in 1993. The plans for the project presented by Bedrock, which is owned by Cleveland Cavaliers owner Dan Gilbert, call for 308 apartment suites with 519 parking spaces. Retail and entertainment usage will be a part of both the top and bottom floors of the building. The top floor will have an outdoor green-space for residents plus a bar or restaurant with an outdoor patio for the public. 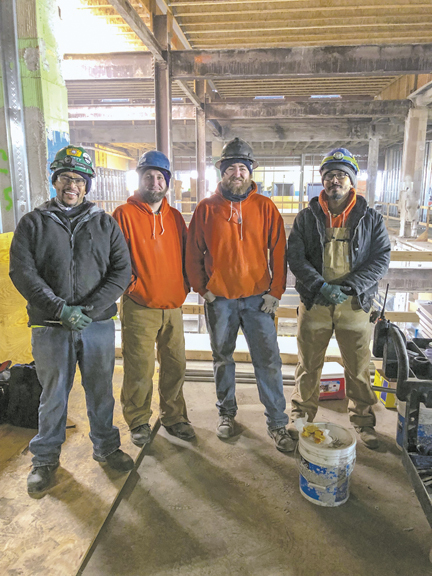 Local 38 members working for Ullman Electric at the May Company Building renovation project include: Craig Cofield (left), Mike Ruff, Dave Feudo and Matt Solomon. L.U. 40 (em,i&mps), HOLLYWOOD, CA — On Jan. 26, Local 40 hosted an excellent steward training class in conjunction with our sister Local 45. The class was taught by Ninth District Int. Rep. Tim Dixon and Int. Rep. Tracy Prezeau. Special thanks to sister Local 45's business manager, Elaine Ocasio, and Victor Marrero, Local 45 business rep, for attending as well. It was a great turnout consisting of newly organized members, newly turned out journeymen, and members looking to be more involved. These members showed an ability to listen, be impartial, think before acting, and respect other points of view. The participants learned the importance of the steward's role and the tools to use while being a shop steward, such as acting as the first step in dispute resolution, promoting the IBEW, and cultivating a union environment. After this class, these members are prepared and looking forward to representing the IBEW and acting as a steward when called upon. In addition to the steward training, the members attended the Los Angeles Kings ice hockey game on March 2 and wore matching IBEW-themed Kings shirts. Attending events like these provides an opportunity for the members to get to know one another outside the workplace and build stronger relationships within our membership. Participants attend steward training class hosted by Local 40 in conjunction with sister Local 45. L.U. 44 (catv,lctt,o,rtb,s&u), BUTTE, MT — On Sept. 2, 2018, Labor Day weekend, Bro. Bill Kipp went trail riding with friends and family. What started out as a fun ride would soon change Bill's life. Making a turn after a jump, Bill violently hit a hidden tree stump. He was thrown over his YZ dirt bike motorcycle and tumbled down a hill. The 213-pound bike followed Bill and landed across his shoulders, instantly breaking his spine. The wreck knocked Bill out. He was airlifted to Great Falls and from there transferred to Harborview Medical Center in Seattle. After an operation, and 3½ hours later, Bill had 12 screws and rods in place to fuse the vertebrae in his spine. Bill spent eight days in the intensive care unit, and he was told he would never walk again. On Oct. 10, Bill stood for the first time since the wreck; he stood with assistance, but still he was standing. Five days later he walked with assistance as well! On Oct. 30, he left Harborview using a walker. Bill's goals for 2019 are to go back to work, ride a bike with his son, dance with his daughter and finally to walk with his wife, Misty. Follow Bro. Kipp's progress on Facebook: Bill Kipp update and prayers. L.U. 76 (c,i,rts&st), TACOMA, WA — IBEW Locals 46 and 76 have been in negotiations with ADT for over two years. Throughout, we've had the unwavering support of our business managers, Ninth District representatives, and organizers. Recently the Ninth District office, at the direction of Int. Vice Pres. John J. O'Rourke, committed two international representatives to assist us. Through their experience, we are pursuing several avenues. We continue to be clear with ADT that our preference is to work collaboratively, but collaboration requires willingness by both labor and management. ADT's lead negotiator, Jim Nixdorf, who's LinkedIn profile states; "Specializes in Decertification Campaigns," tried to spearhead a decertification here. He failed. When ADT contested that election, that effort failed also. In the aftermath, Nixdorf has created a division within the bargaining unit that must be overcome if we are to be effective at the negotiating table. As it stands, ADT is offering a contract far inferior to members' expectations, yet blames the IBEW for the inability to reach an agreement. ADT's illegal conduct has been recognized on several fronts. In the days after the decertification election, ADT fired two employees. The general counsel of the National Labor Relations Board prosecuted ADT for firing these employees on the basis of unlawful retaliation. A decision from the administrative law judge is due at any time. No matter how that hearing comes out, these terminations (and perhaps a third) will be challenged in arbitration as they lack the "just cause" required by the contract. Second, ADT illegally changed the pay cycle from weekly to bi-weekly, then ignored the arbitrator's binding decision to start paying weekly. The IBEW filed suit in federal court to enforce the arbitrator's decision. The judge found that ADT acted in "bad faith" by refusing to comply. ADT was ordered to explain to the arbitrator why it has not complied and to pay the IBEW's attorneys' fees that were incurred in order to enforce the decision. Unfortunately, the legal process is slow. In the meantime, our sisters and brothers at ADT and Protection 1 are suffering through this process. Throughout all of this, ADT has used the former Protection 1 employees as pawns. On the one hand ADT says the former Protection 1 employees are now fully part of the bargaining unit and the CBA is applicable to them. Nixdorf made this representation to the NLRB, to the arbitrator, and to the federal court. Yet at the same time, ADT refuses to extend the contract conditions to these employees, including paying some former Protection 1 employees up to $4 per hour less than the current negotiated pay scale. A grievance contesting ADT's failure to honor the CBA with regard to the former Protection 1 employees is pending and it, too, will be litigated in arbitration. ADT's attempted division of the former Protection 1 employees from the rest of the bargaining unit, like its efforts to divide our members as a whole, continues; but this will not be tolerated, and it will not succeed. IBEW - ADT Negotiating Committee: from left, front row, Local 76 Bus. Rep. Clint Bryson; Local 46 Bus. Mgr./Fin. Sec. Bud Allbery; Ninth District Int. Rep. Dave Myers; Local 46 steward J.D. Wilson; Local 76 steward Ken Ellison; Local 76 steward Larry Jones; Local 46 steward Jeremiah Dunn. Back row, Local 46 Bus. Rep. Mark Samuelsen. Not Pictured: Ninth District Int. Rep. Rick Hite. L.U. 68 (i), DENVER, CO — Greetings, brothers and sisters. Local 68 held its annual Christmas party for our members and their families on Dec. 8 last year. There were 417 kids at the party, with total attendance over 800; this was one of the largest Christmas parties we have hosted in a while. Thanks to all of the volunteers — it is because of their efforts that the Christmas party was such a success. Thank you to all! The election for Local 68 officers is coming up soon. Nominations will take place at the general membership meeting on May 7, and the election will be held in June. Please ensure that the hall has an accurate mailing address for you and watch the mail for notices. I would also like to encourage anyone who is considering running for an office or position to do so. Talk to someone who holds, or has held, the position that you would like to run for so that you have an understanding of the responsibilities that come with that position. Good news for Colorado: On Jan. 29, right-to-work legislation was defeated once again! We extend our deepest sympathy to the families of our recently deceased Local 68 brothers and sisters, including: Larry Guesnier, Joseph I. Wolfinbarger, Howard J. Goodman, Jack Averman, Clifford J. Houston, James R. Pinkston and Allen L. Oakley. Local 68's Christmas party for members and their families in 2018 was a great success. L.U. 80 (i&o), NORFOLK, VA — We hope all our brothers and sisters had a wonderful holiday. With a new year underway, Local 80 has an abundance of work coming up in our jurisdiction. We have numerous projects starting in early spring. This includes work at the Microsoft project in Boydton, VA, and jobs on our military facilities. The Wegmans grocery store in Virginia Beach, VA, is progressing and should be completed in early spring. The local looks forward to our upcoming Local 80 Annual Picnic, scheduled for May 4. We also have negotiations in March. To all our brothers and sisters, keep up the solidarity and always remember: "We grind together, we shine together." We mourn the loss of several members: Bros. Larry Webb, Timothy Woodington, Jan Sutton Sr., and Robert A. Smith. They will be remembered. L.U. 98 (as,catv,em,i&it), PHILADELPHIA, PA — 2018 was a great year for Local 98. 2019 should be even better. Bus. Mgr. John J. Dougherty just completed a three-year health care agreement with Blue Cross that saved the local $8 million in the first year alone. Philadelphia Mayor Jim Kenney has signed 119 project labor agreements (PLAs) with the Building Trades, which include multiple-source projects, bringing the total to more than 160. Phase One of the East Market redevelopment project by National Real Estate Advisors, which includes significant IBEW pension dollars, was recently completed. When finished this year, the $1 billion project will transform this dormant but important section of Center City Philadelphia. The $1.5 billion Penn Medicine Pavilion includes the construction of 500 new patient rooms and 47 operating rooms. Both the Sheraton Hotel and the Loew's Hotel in Center City are undergoing major renovations. At least nine new hotels will be coming out of the ground this year. The $250 million transformation of the former Inquirer building into the new Police Administration Building will begin this year. The city's second casino, located in the stadium district in south Philadelphia, has broken ground and will include a hotel and office complex. Business for our Sound and Communications division is up, as is our market share in Montgomery County, thanks to the hard work of our 98 North team. We secured three important Responsible Contractor Ordinances (RCOs), two townships and a school district, assuring 98 North of ample work in these important regions. L.U. 124 (ees,em,i,mar,rts,se,spa&t), KANSAS CITY, MO — Local 124 has been around for 114 years. Some years have been better than others for sure. In our industry, the work comes and goes. We stress to our apprentices to save and spend down any debt during the good times to help for the inevitable lean times. This commonsense lesson is absent from the new federal tax code passed by the Republican-controlled Congress and signed into law by Pres. Trump. The new tax code adds an estimated $2 trillion to our national debt. Yet another credibility hit to the Republican lie that they are the fiscally responsible party. This tax law permanently strips most of the working persons' deductions. We will survive this anti-labor administration — this I have no doubt. But continually playing defense gets old. Measuring our success by mitigating loss instead of actual gains gets old. Labor certainly deserves better. Better representation that is. It's all about the election of public officials. Elections are key to moving the IBEW forward for the next 114 years. In solidarity. L.U. 130 (i), NEW ORLEANS, LA — Our year kicked off with steward training provided by the I.O. That was followed by the Louisiana Building & Construction Trades Conference, and an instrumentation seminar given by Fluke and other industry professionals. In March, Local 130 provided the venue for the five-day AFL-CIO Executive Committee meeting held in our Alexander Room. Our Alexander Room is the new shining star in the business and catering world. It has attracted attention as a versatile facility for business functions. 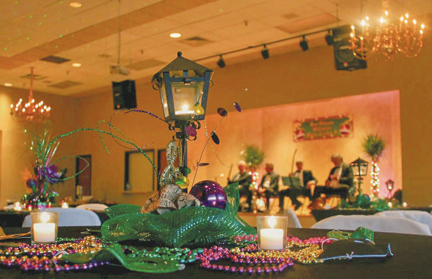 Dignitaries from Tulane University, Alpha Epsilon Pi fraternity, the Jefferson Parish government, Chappelle High School, and area businesses are regular clientele. Our Apprenticeship Committee is busy working to convert day school to night school, due to a recent contract change requested by our contractors. On-the-job training is a requirement of apprenticeship. It is the responsibility of every member to assist our apprentices and mentor them. An apprentice should never be told that he is not being paid to learn. Production is the key to our success, but education is the key to our production. The work picture is steady. The airport project is wrapping up; however, the build-outs continue, and many are going to our smaller contractors. Ordes Electric was awarded work in the PBF Refinery in Chalmette, LA. It is one of the few electrical contractors that actively pursue industrial construction. The RENEW Committee meets regularly to strategize their goals. Our younger members are active and involved. Thank you, brothers and sisters, for your participation. Our organizers are using new technology to attract new members. Geo-Fencing allows us to send a union commercial to every phone in a geographical area, such as a job site or open-shop contractor. With job-site visits and informational handouts, organizers are keeping a steady flow of new members. We look forward to another productive year and maybe a second chance at the Super Bowl. Go, Saints! Local 130's Alexander Room during a recent event. L.U. 164 (c,em,i,o&t), JERSEY CITY, NJ — On Sunday, Dec. 9, last year we held our annual Children's Christmas Party. As usual, it was a wonderful event and was well-attended by members and their families. As with all our events, the children's party represents the best of what our local has to offer. A day of family, friends, brothers and sisters, and holiday cheer. This event is particularly special because it offers us the opportunity to spend time together with the families of our members. It is a special time of year when we are filled with the holiday spirit of giving. There are many fun activities for the kids, including entertainment by Stretch the magician, a bounce house, a photo booth, and a Batmobile! Some of the kids' favorite costumed characters attend, such as Elmo, Dora the Explorer, Spider-Man and, of course, Santa. This day wouldn't be possible without the assistance of many members who help put on this feat of holiday fun. Thank you to all for helping with set up and assisting on the day of the event. The party committee, headed up by Bro. Matthew Benevento, works for months in advance to prepare. Thank you to Matt and the committee, who all deserve our heartfelt thanks, including Dion Pindilli, Chris Thompson, and Training Dir. Rich Paredes, former party committee chair. Thanks to everyone who helped make the party pure holiday magic. Local 164's 2018 children's Christmas party committee. L.U. 212 (i), CINCINNATI, OHIO — Three Local 212 members recently received commendations for their life-saving efforts. On Sept. 6, 2018, Juan "Manny" Montoya found himself in the middle of a chaotic scene. A shooter entered a building where Juan was working. Instead of running out the nearest exit, Juan ran to warn those in harm's way and showed them safe passage. 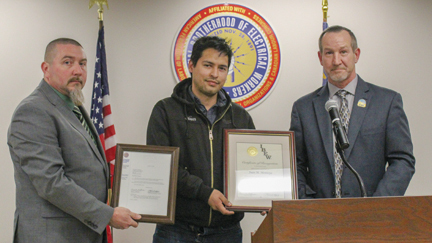 Juan received a Certificate of Recognition from the International Office of the IBEW. It was noted that, "His actions brought great credit to our industry and our Brotherhood and we are grateful." In the early hours of Dec. 10, 2018, a fire broke out in an Avondale home. The family was awakened by their smoke alarms. Joseph Schroth and Anthony Mazzella, both Local 212 members, were on a team of four people who installed those smoke alarms. They were there as part of the Home Fire Campaign with the Red Cross in 2016. As a result of the earlier smoke alarm installation, all 13 family members made it out unharmed. Joseph and Anthony were commended at a ceremony at The Red Cross. Our union is not a spectator sport! Get active. Tag, you're it. Local 212 member Juan Montoya (center) receives certificate presented by Pres. Jason Mischke (left) and Bus. Mgr. Rick Fischer. L.U. 234 (i&mt), CASTROVILLE, CA — Our Local 234 Annual Family Barbecue, held Sept. 29, was very well-attended, reflecting how our membership has grown. Heartfelt thanks go to our barbecue organizers. it was particularly satisfying to see our many members and families, young and old, enjoy the food, fun and games. Among the many other wonderful activities, the local takes the opportunity to honor our members' diligent years of service. Although there are too many names to list here, we wish to particularly honor the following longtime members: Leland Knisley (70-year member); James Myers, Donald Moore, Siegfried Matt, Robert Koenig, Richard Baker (65-year members); and Ronald Smith and Lawrence Tuckness (60-year members). Thank you to all for your service to our community and industry. L.U. 236 (catv,ees,govt,i,mo,rtb&t), ALBANY, NY — As of this writing our work picture has slowed, but we have some large projects on the horizon. We thank the locals that are currently putting our members to work. Local 236 organized two new contractors. Organizer Chris Lambert signed Stonecreek Electric, and organizer Kevin Fuller signed Hometown Electric. Congratulations to both contractors and we wish them success. New York State has adopted a new mandate that states: "Every employer in the New York State is required to adopt a sexual harassment prevention policy." We applaud our contractors that have been proactive and given this job-site training to our members. Brothers and sisters, we have taken on a new project; Local 236 will mentor high-school students and help wire a "tiny house" for a veteran who has fallen on hard times. One of our local signatory contractors, H. Clune Electric, has generously offered to donate the material. We will keep you posted as this project progresses. Local 236 has contract negotiations coming in 2019 and we created an e-mail site for your suggestions. We welcome your comments and suggestions during this important time. Call the union hall for the e-mail site address. L.U. 280 (c,ees,em,es,i,mo,mt,rts&st), SALEM, OR — The work picture remains strong in our jurisdiction. 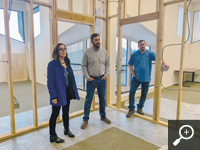 Data centers continue to employ traveling brothers and sisters in central Oregon. Work is picking up in the Eugene/Springfield area with University of Oregon's rebuild of the historic Hayward Fields track facility. This project is state of the art from the ground up. Not far from that project are the accelerated science buildings, also at the University of Oregon. Manpower is at a premium as of this writing. Apprenticeship and CTE (Career and Technical Education) programs have become buzzwords in our Capitol buildings in Oregon. The worry now is that feel-good legislation to further apprenticeship could undermine our success by funding direct competition at the community college and college levels. Tax dollars given to organizations without a proven track record, unlike the IBEW, will create problems when the money grab begins. Such legislative proposals come with the belief that apprenticeship can be done solely in the classroom. This undermines the whole "earn while you learn" backbone of our training. On the heels of these potential threats, Gov. 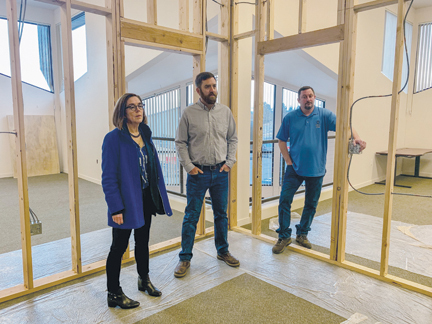 Kate Brown made a visit to us at the soon-to-be Central Oregon Training Center on Feb. 1. This is the first time that I am aware of that a sitting governor has visited a Local 280 training facility in the valley or high plains. The trades have our elected officials' attention. Oregon Gov. Kate Brown, visiting the site of an upcoming Local 280 training facility, with Local 280 Reps. Kail Zuschlag (center) and Robbie F. Smith. The training facility site is undergoing renovation and is planned for completion in the spring of 2019. L.U. 302 (i,rts&spa), MARTINEZ, CA — Local 302 accepted 454 apprentice applications in January, and we look forward to bringing in new brothers and sisters soon. Organizing efforts are paying off. We swore in 87 members during 2018. We are encouraged to see members getting involved in the local and the community. Thanks to those who volunteered at the Women's March in Concord, on Jan. 19, for the Grateful Garment Project. Participation in community events, and letting people know who and what our organization represents, benefits us all! L.U. 306 (i), AKRON, OHIO — In December our annual Children's Christmas Party was held at Todaro's and as usual it was a huge success. Thanks once again to our group of officers, committee members and volunteers. We couldn't do it without you. Also in December at our monthly union meeting, service awards were presented to active members and retirees. Recipients included: for 70 years of service — Richard Donley, James Ess and Donald Kromer; 65 years — David Westland; 60 years — Harry Bryner, Kenneth Dias, Jack Dutton, Leonard Eddy, Richard Glatz, Daniel Gourley, Donald Heffner, Charles House, Thomas Kempel, Robert Martz, Russell Pease, Eugene Puglia, Jerry Seals and Charles Stoltz; 55 years — Jack Difiore, Donald Faught, George Peters, F.W. 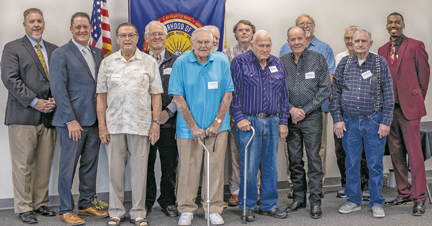 Raymond, Carlos Shorter and James Sich; 50 years — Joseph Conley, John Dague, Richard Hill, Paul Jones, Richard Junkin, George Manus, David Newman, Stephen Obarski, Thomas Orr, David Patterson, Matthew Pramik, James Pudloski and Michael Turner. For 25 years of service — Steven Blatt, Thomas Neely, Larry Fesler, Jeff Fausnight, Bruce Tucker, Michael Abshire, Michael Crabtree, Mark Haywood, Daniel Lammlein, Timothy Marusiak, Frank Wilson, Michael Hildebrand, Nicholas Taras, David Petryshak, Matthew Montecalvo, John Schilling and Ronald Henry. Congratulations and thank you to all for your dedicated service to the IBEW and Local 306! With great sadness we report the passing of retired Bros. Courtney MacDowell, Robert Masters, Merle Erbs, David Brisbin, Eric Hardgrove and Robert Cannady. We send our deepest condolences to their families. L.U. 340 (i,rts&spa), SACRAMENTO, CA — A pin presentation was held in October 2018 for Local 340 members who received their 50-plus years of service pins and certificates. Among the things I really enjoy at this event are the stories these members share about their years in the trade as apprentices and as journeymen. I always wish that the newer members, or the members who have just turned a little apathetic about the local, could be there to see these proud retired members sitting with brothers and sisters they haven't seen in many years and filling that room with laughter and true brotherhood. It gave me an idea that I want to do this year's pin presentation event a little differently. Since the local has moved into a new building, we are going to have a Local 340 Open House for all the members this spring and incorporate it with a pin party for all members. We'll be presenting pins to members for their years of service ranging from five years to 65 years. This is the absolute perfect time for Local 340 right now, not only to honor the members who got us this far but also to show our new, younger members (who will keep us strong for years to come) that the IBEW is much more than a job. We're about loyalty to a union trade, comradery, families, community involvement and brotherhood — and we are growing! I am happy to report that Local 340's active member count just went over 1,700 in January, and almost everyone is working. What a great time to be IBEW! 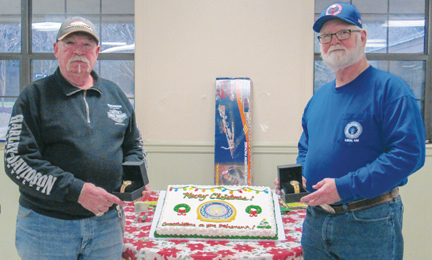 Local 340 retirees receive years-of-service pins. Extending congratulations to the honorees are: Int. Rep. Michael Meals (left), Local 340 Bus. Mgr. Bob Ward (second from left), and Vice Pres. Mitchell Newman (right). L.U. 342 (i,lctt&o), WINSTON-SALEM, NC — On Dec.15, IBEW Local 342 held its second annual Christmas party at the Holiday Inn in Greensboro. The staff at the hall put this event together and did a fantastic job. We had a great turnout, from retired members and their families to apprentices and their families, and everyone in between. Brotherhood and solidarity were on full display as the 50/50 raffle for the sick and needy was raffled off again and again, before a brother donated it back to the fund. Looking back at last year, signatory contractors Abco South Electric, White Electric, and Cogburn Brothers were working in our jurisdiction just to name a few. Int. Rep. Carmella Thomas was here for a weekend to conduct new officer training, as well as Code of Excellence and COE steward classes. We are optimistic that 2019 will see our local flourish with several large projects slated to begin in our jurisdiction. The local union staff are working tirelessly to organize the best and brightest in our area, and they are visiting contractors to educate them on what the IBEW has to offer. We are confident our local will grow due to the excellent quality of work our members demonstrate. The local is seeking a larger space to further the education of our members by incorporating labs and an assigned craft-certification space. By instituting this training, we can further distinguish the IBEW as the best of the best. L.U. 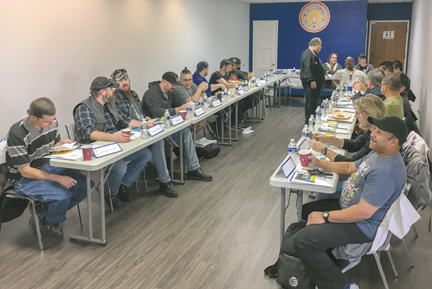 400 (es,i&o), ASBURY PARK, NJ — As 2018 came to a close, IBEW Local 400 ended the year with success on the local political scene as well as within the local. Through our labor-walk campaigns, all local political candidates in support of labor experienced victory. Local 400 spent every Saturday from October through Election Day spreading the message of the candidates who embrace the values of those who are represented by organized labor. These candidates ranged from local school board members to U.S. congressmen, on both sides of the aisle. In December, IBEW Local 400 hosted its Annual Breakfast With Santa event for all the members and their families. Once again, the event was a great success with nearly 100 families in attendance for a morning of food, friends, family and a visit from Santa. As we look forward in early 2019, we anticipate another year filled with success and good fortune. Local 400's December 2018 Annual Breakfast with Santa for members and their families was a great success. L.U. 446 (i), MONROE, LA — Congratulations to our four Local 446 members who retired in 2018: Bros. Floyd E. Sandiford II, Johnny B. Evans III, Robert V. Wade Jr., and Bruce A. Black. We want to thank you, brothers, for your years of service in representing IBEW Local 446 with such pride and dedication. Best wishes to each of you in your retirement years! Recently retired Local 446 members Robert Wade Jr. (left) and Floyd E. Sandiford II. L.U. 538 (i), DANVILLE, IL — Congratulations to the Danville City inspectors, a newly organized group of six new members for Local 538. After almost two years of negotiations and arbitration, they achieved their first contract with the City of Danville, IL. They can now enjoy the benefits of being represented by the IBEW. Thanks for everyone's dedication, patience and solidarity in sticking with the process to get to this point. From left: Local 538 organizer John Gallez; new members Jim Meharry, Don Crews, Kenny Harden; and Bus. Mgr. Mike Arbuckle. Not pictured: new members Paul Storke, Stephen Chrisman and Rick Brown. L.U. 558 (catv,em,i,lctt,mt,o,rtb,rts,spa&u), SHEFFIELD, AL — Greetings, brothers and sisters. At this writing, the work outlook in Local 558's jurisdiction is steadily improving. The new Mazda/Toyota assembly plant project has finally kicked off. This project is one of the largest ever to hit our jurisdiction and with strategic organizing efforts in full motion the local union will still be in need of manpower. In addition to having the local's Strategic Organizing Plan in motion, and in consideration of the manpower projections and anticipation of all the upcoming work in our jurisdiction, the Electrical Training Alliance and Local 558 have been prompted to take on the local's largest class of apprentice wiremen ever, consisting of 63 students in 2018. 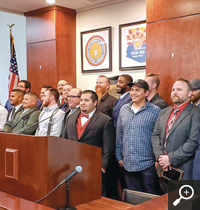 Pictured in the accompanying photo are first-year apprentice wiremen on obligation night at the regular local union meeting on Nov. 5, 2018. We are happy to announce that the IBEW Local 558 Picnic is set for May 18 this year. The picnics are always a great event for members and their families to fellowship, reminisce and enjoy a great time together. We would like to thank all members for their hard work and dedication to the IBEW. Local 558 first-year apprentice wiremen participate in obligation night at union meeting on Nov. 5, 2018. L.U. 586 (em,i&o), OTTAWA, ONTARIO, CANADA — Local 586 hosted a wonderful night of music in the heart of Ottawa. With over four hours of live entertainment, our members let the nation's capital know that the IBEW is not only the best in the electrical industry, we can also rock harder than anyone! 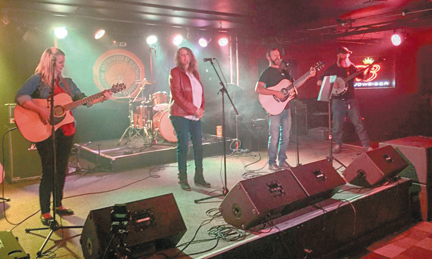 Pictured in the accompanying photo are Local 586 members Sheldon Campbell and Jake Woolsley performing with their band, the BackRoadies. The evening was a great success. Thanks to all who participated. Local 586 members Sheldon Campbell and Jake Woolsley took the stage with their band, the BackRoadies. L.U. 606 (em,es,i,rtb,spa&u), ORLANDO, FL — Work in the Orlando area continues to be good with Local 606 picking up market share. At the time of this writing, our NECA partners are aggressively bidding work and the local is working with the Central Florida Building Trades in negotiating a project labor agreement (PLA) in our area. All the new work has created a need for more electricians in an already tight labor market, and the organizing department is constantly adjusting to find new ways to recruit and organize new members. The construction boom here in Orlando is projected to continue at least through the rest of 2019. It is with great sadness that we announce the death of member Robert True. Bro. True was a member of Local 606 for 21 years and he will be sorely missed. L.U. 640 (em,govt,i,mo,mt,rts,spa&u), PHOENIX, AZ — Greetings, brothers and sisters. 2018 was a good year for us. Our work picture continues to look very bright for 2019. We welcome our traveling brothers and sisters to come and help with the work, and enjoy the weather. We have hired three new organizers and our program is progressing very well. We would like to congratulate our Local 640 Bus. Mgr. Dean Wine on his appointment to the International Executive Council. We also would like to recognize our 2018 apprentice graduating class for their hard work and diligence in achieving their goal. Congratulations to our new journeyman brothers and sisters! Local 640 congratulates the recent apprenticeship graduating class. L.U. 666 (i,mt&o), RICHMOND, VA — Local 666 is heading into spring with a strong, focused eye on the future. We are pleased to report that our jurisdiction is busy with several projects of varying sizes and states of completion. As always, we sincerely thank the IBEW brothers and sisters from other jurisdictions who have filled calls, and we encourage other travelers to keep us in mind as more projects man up in the near future. 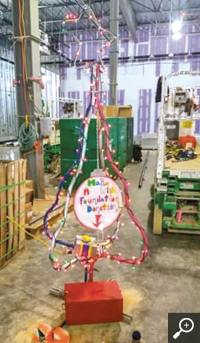 When challenged to bend a Christmas tree out of scrap conduit, journeyman Michael Poindexter not only completed the task, but also constructed a donation box underneath it (see accompanying photo). He was able to turn a humorous breakroom challenge into a $2,700 collection for the Make a Wish Foundation. His efforts earned praise from the general contractor and demonstrated to all the trades the skill and spirit of our Brotherhood. A special effort was made, in conjunction with the Virginia AFL-CIO, to organize member involvement during the 2019 Virginia General Assembly session. Thanks to all the members who called, emailed, or met in person with lawmakers during the 45-day session. Their actions ensured that our voices were heard, not only on the job site, but in the legislative halls as well. 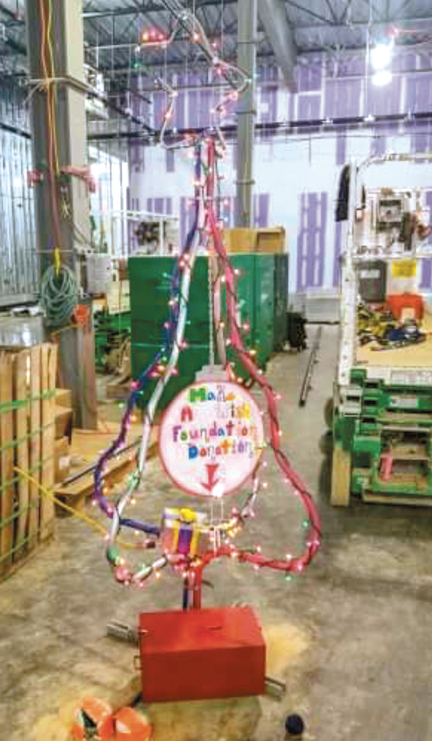 Local 666 journeyman Michael Poidexter constructed a "Christmas tree," built with scrap conduit, to raise funds for the Make a Wish Foundation. spa,st,t,u,uow&ws), WEST FRANKFORT, IL — We recently completed early bargaining with Vectren and members there ratified a new three-year agreement. Many other properties will be in negotiations this year, including: Vistra, formerly Illinois Power Generating Co. - Newton Energy Center, (both Clerical and Physical groups); Ozark Border Electric Cooperative (Physical group); SEMO Cooperative (both Lineworkers and Clerical groups); City of Miner (both Police Officers and City Employees groups); Sikeston Board of Municipal Utilities; Pemiscot Dunklin Cooperative; and Tri-County Electric Cooperative. This year, we anticipate work picking up for our Inside Construction members as new Illinois Gov. J. B. Pritzker has restored project labor agreements (PLAs) and prevailing wage. As such, we will be starting a new class of inside wireman apprentices this year, so watch our website for further details. We continue our strong support for the Union Sportsmen's Alliance with a $25,000 charter-level sponsorship for the year. The local will once again host our golf tournament on June 21 this year with all proceeds benefiting The Poshard Foundation for Abused Children. As of this writing, our referral books are as follows: Inside Construction — 114; Outside Construction — 28; Line Clearance — 4. 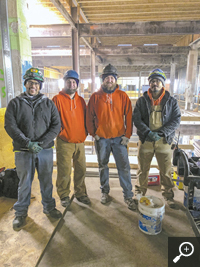 Attendees gather for a group photo at Local 702's "topping out" celebration for Outside Construction members who obtained journeyman lineman status during calendar year 2018. L.U. 712 (c&i), BEAVER, PA — The work outlook is still very good here. We have contractors Great Arrow Builders, Sargent Electric, Enerfab, Hatzel & Buehler, VEC, Lighthouse and Prime Electric working at the Pennsylvania Chemicals project in Monaca, PA. This is a long-term project with scheduled completion by 2021. The project is currently working five 10-hour days plus one 8-hour day per week. A background clearance is required, which normally takes one to two weeks, and workers with TWIC cards normally take one to two days. Initial manpower projections indicate the need for 1,000 electricians by the end of 2019. Workers who have a permanent residence more than 60 highway miles away from the plant shall receive a per diem allowance of $63 for each day reporting for work, and all workers employed at PA Chemicals will receive $14 for a site allowance each day they report to work. Additional calls will be coming for the 1-gigawatt combined-cycle Hickory Run Energy Center. This is a Kiewit project with Bruce & Merrilees Electric Co. as the electrical contractor. The Hickory Run power station project is currently working five 9-hour days per week. The referral office is open for signing the book from 8 a.m. to 4:30 p.m. on Monday through Friday. A current dues receipt is required. L.U. 716 (em,i,lctt,rts&spa), HOUSTON, TEXAS — Hello to brothers and sisters here in our local and all across the IBEW. At the time of this writing work is still slow in Houston, but there is a lot of work being bid. Hopefully our work picture will brighten soon. We appreciate all the local unions around the country who have put our members to work. Congratulations to Bro. 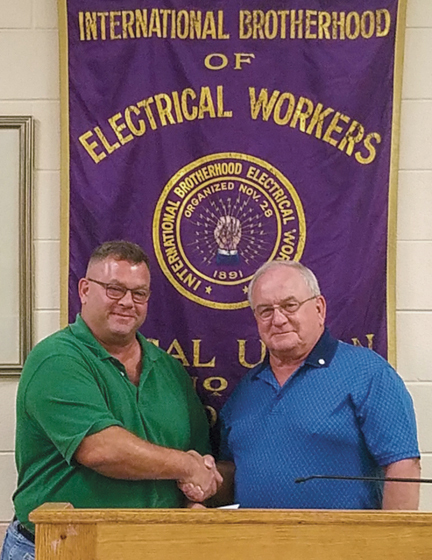 Damon Sebren on his appointment as Local 716 business manager/financial secretary to fill the unexpired term of Bro. John E. Easton Jr. Again, we thank Bro. Easton for his continued service to our local. We thank all the members and their families who participated in the St. Patrick's Day parade and the Cesar Chavez parade. Building and decorating the float, walking or riding in the parades — these are just additional ways for Local 716 to get our name out in the community. Brothers and sisters, your community service is truly appreciated. Not feeling appreciated? Volunteer and donate some time to help your local union perform a community service project. Still seeking all members to get registered to vote and help advance the interests of working people. Reminder to members: The Death Benefit Fund and the Sick and Accident Fund were set up for the benefit of members and their families. L.U. 728 (em,i,rts&spa), FT. LAUDERDALE, FL — Big congratulations to Local 728 retired former business manager David Svetlick, who received an honorary plaque from his local. Born in 1949, Bro. Svetlick has had a successful career with the IBEW. It all started in the 1970s when he became an apprentice. Bro. Svetlick traveled the U.S. as a journeyman wireman, lending his skills to job sites across the country. In 1983, he joined the negotiation committee. In 1994 he was hired into the hall as an organizer, and his career took off from there. He began serving on the trust committee in 1997. From 1997 to 2007, he served as Local 728 president. In 2007, Bro. Svetlick began his tenure as business manager. During this term, he navigated our great local union with finesse, through the great recession. He recently retired from the business manager position in 2018. Local 728 officers, members and staff wish Bro. Svetlick a long and healthy retirement. Big shout out and congratulations to the class of 2018 apprenticeship graduates. May your careers as IBEW journeyman wiremen be lucrative, productive and fun-filled! The 2018 graduates are: Jeandy Brisson, Steven Butz, Brian Callahan, Vincent Fortune Jr., Brian Francisco, Steven Hatton, Justin Jones, Jason Lansing (student of the year), Joseph DeRosa, Gabrielle Malicki, Brent Oberfield, John Prussing, Steven Queen, Bobby Roberson, Jason Sheppard, Matthew Arigo, Phillip Brisson (student of the year), Demarcus Bullard, Timothy Krawitz, Leighton Stewart and Justin Williams. Retired former Local 728 business manager David Svetlick. L.U. 776 (i,o,rts&spa), CHARLESTON, SC — Everyone hunkered down for the winter and things slowed down as the temperature dropped to polar levels in some places. Charleston is usually fairly temperate due to the warm ocean currents, but a bit farther inland it hasn't felt very southern! At the time of this writing in February, someone jokingly suggested that we file a complaint with the National Oceanic and Atmospheric Administration as soon as the latest government shutdown ended! In our last missive, we announced our 2018 graduating apprentices. It is with a heavy heart that we bear the untimely passing of one of them, Brian Sineath, who succumbed to cancer. He died a journeyman. He was an exemplary member, involved in the local and always practicing the highest standards of workmanship while also being kind and never antagonistic toward others. He would have been a great foreman. Bro. Sineath was one of those people who will be missed by everyone. We had a strong 2018 adding an Amazon project, a fiberglass plant project, and office building work to our existing data center and steel mill work — and this year will be stronger yet. Our pay scale goes up another dollar as of March this year, and we've renovated our union hall. Spring promises to grow jobs along with the flowers in Charleston and upstate South Carolina. Check with us if you're in traveling mode. It's a great place to be I.B.E.W. L.U. 804 (i&o), KITCHENER, ONTARIO, CANADA — 2017 was an election year in Local 804, and newly elected Bus. Mgr. Mark Watson and his team have worked diligently to lead the local union in a new direction. All factors indicate that the dawn of a new day and the beginning of something new and exciting are on the horizon. Our leadership recognizes that our signatory contractors are our "partners in industry," and that our union and our contractors need each other to be successful. Mark's team has worked to strengthen relationships with our employers, and both parties to the collective bargaining agreement have a renewed sense of confidence in one another. The draconian rules once attached to market recovery initiatives have been adjusted, and we now see our contractors willing to bid projects that they would not have considered bidding in the past. The local union's renewed relationship with its contracting partners continues to move toward that of a highly effective partnership, which will enhance our chances of being successful today and tomorrow. Each party to the agreement has a role to play, and we must ensure that we give our employers an honest day's work for an honest day's pay. 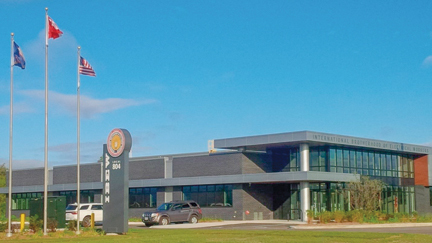 IBEW Local 804's Union Hall and Training Center. L.U. 890 (i), JANESVILLE, WI — IBEW Local 890 Bus. Mgr. Leo Sokolik presented Bro. William Lois with his 55-year IBEW service pin at the local's annual holiday party held Saturday, Jan. 5, this year. Bro. Lois was initiated into the IBEW on April 1, 1963. Bro. Neil Messerschmidt, initiated on Oct. 1, 1973, received his 45-year pin. Others receiving service pins included: Nick Bell, Jim Laveen and James Steig (30-year pins); Russell Whitehead (25-year pin); James Anton, James Bemus, John Blake, Michael Duda, Jason Heidenreich, Brian Jacobson, James Kubiak and David Moore (20-year pins); James Brooks, Brian Cullen and Matt Wellnitz (15-year pins); Craig Ibeling (10-year pin); and Garrick Harwick (5-year pin). Congratulations to all service-award recipients! Local 890 Bus. Mgr. Leo Sokolik (right) presents Bro. William Lois with his 55-year service pin at Jan. 5 holiday party. L.U. 1116 (em,lctt&u), TUCSON, AZ — Please join IBEW Local 1116 in congratulating journeyman lineman cableman Sameer Mendez. Sameer was awarded the Charles R. Huggins Community Service Award, which is given to an outstanding apprentice who has also donated time to volunteerism. Sameer regularly gives electrical safety presentations at company and community events, science fairs and in classrooms. The goal of the presentations is to educate kids about the importance of safety around electricity. Congratulations, Sameer! Previous recipients of the Huggins award have gone to members Jessica Marchbanks (2016) and Susie Petty (2014.) 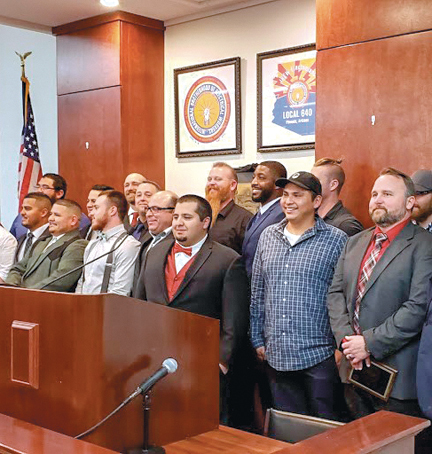 Three other apprentices were honored as outstanding apprentices: Ismael Grijalva (journeyman electronics technician), Tyler Stevenson (journeyman substation electrician) and Kevin Wemmer (journeyman HEAT operator.) Congratulations to all of you, honorees! The skills these brothers and sisters exhibit are proof that IBEW members are the best in the business. Local 1116 has officially launched its Women's Committee. It is chaired by E-Board members Alberta Adrian, Sharon Williams and Jackie Ehresman along with Susan Trumbull. I would like to thank Susan Trumbull for her years of dedicated service as Local 1116's recording secretary. Susan stepped down from her position in December as she prepares to retire. We would also like to welcome Alberta Adrian to our Executive Board, filling the administrative position. L.U. 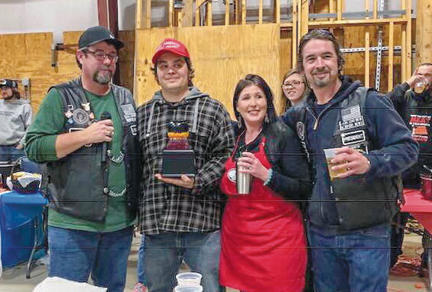 1340 (i&o), NEWPORT NEWS, VA — The Local 1340 Motorcycle Club held its first Chili Cook-Off on Jan. 27. Plans are to make this an annual event. The Chili Cook-Off was held to benefit the Virginia Peninsula Food Bank. We had four divisions for the event. Retiree division: winners Paul and Vivian Bryan; Apprentice division: winners Rachel Cornelison and Billy Blaylock; Maintenance division: winners Scott Sundeen and Mom; Construction division: winners and grand champions Lorenzo and Melissa Pacheco. Turnout was phenomenal, and everyone had a good time. With sadness we report the passing of Bro. Joseph "J.J." Jarrell. Bro. Jarrell passed away on Friday, Jan. 11, at the age of 74. Our condolence go out to his family. At Chili Cook-Off: Local 1340 Motorcycle Club Vice Pres. Gerald "Doc" Dix (left); Lorenzo and Melissa Pacheco; and Motorcycle Club Pres. Aaron Woodard. L.U. 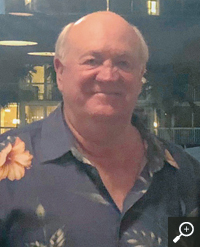 2304 (u), MADISON, WI — One of the IBEW's most longstanding local union business managers has retired. 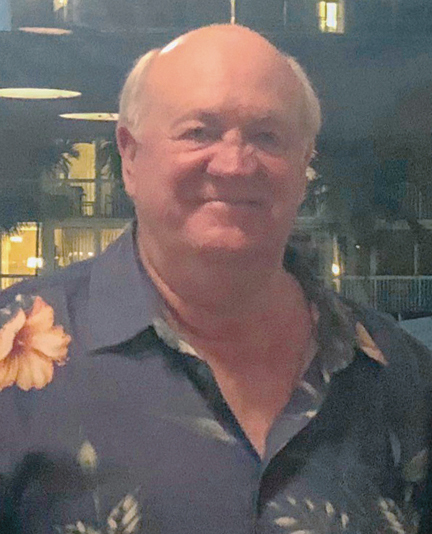 Dave Poklinkoski started his career with Madison Gas & Electric as a temporary laborer at Blount Generating Station in the fall of 1978 and joined the company full time shortly thereafter. 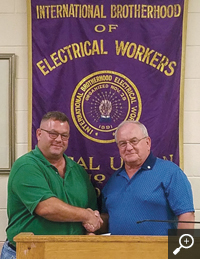 Following probation, Dave became a steward and in September 1985 was elected president and business manager of IBEW Local 2304, where he served until his retirement in October 2018. 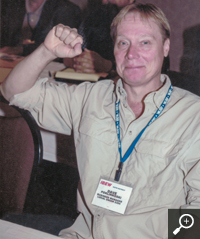 Dave played an instrumental role during his time with Local 2304, most notably maintaining 100 percent membership despite the more recent change whereby Wisconsin became a right-to-work state. Dave also actively contributed to the broader labor movement in addition to his Local 2304 service. He helped organize support for the UFCW Local P-9 strike at Hormel in August 1985 to preserve fair labor practices for plant employees. Dave also helped found the Utility Workers Coalition in the early 1990s to fight deregulation of the utility industry, integrate workforce planning at utility companies, and establish maintenance and service standards for the generation, distribution and transmission of electricity. For all Dave's hard work and dedication to the labor movement, thank you from the IBEW Local 2304, the IBEW, and the labor movement! Local 2304 then-business manager/president Dave Poklinkoski attending an IBEW Sixth District conference.